Aura Color Test - Understand Yourself Better. 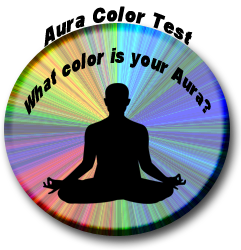 The Aura Color Test provides you with deep psychic insight, and will help you live a better life based on the color of your Aura. Certain colors are exciting, others are calming. Most people have a favorite color, with blue being the most highly preferred. Some of us find pleasure in certain colors, and displeasure in others. Perhaps not surprisingly so as coloration is one of the most critical attributes of the human aura. To do the Aura Color Test grab a piece of paper and answer the following questions by deciding which one best describes you. Write down only the corresponding number of your answer. At the end of the Aura Color Test you'll find a chart that reveals your aura color. I spend the day meditating and have a simple lifestyle. I really enjoy helping people and I'm a caregiver. I'm into organic foods, vitamins and yoga and make friends easily. I'm the life of the party, love being with other people and love to chat. I'm very considerate and thoughtful of other people's feelings. I'm athletic, and people mistake my energy for aggression because I'm very competitive. I'm sentimental and even cry over commercials and can't stand to see anyone in pain. Will my clothes get dirty? If they will then I can't do it. Yes. Yes. Yes. I hate telling anyone no. In school, I didn't take shop class just for something to do. I love hands-on work. Yeah, I know I have very high expectations, but that's the perfectionist in me. Just put the project down in front of me and say you don't think I can do it. I'd take one for the team any day! Now listen up, this is what we're going to do, I'm the team leader for a reason. I believe I'm here to be of service to others and will do whatever I can to help. I'm the rebel in the crowd, tell me not to do it, and I'm determined to do it. I love talking, sharing information and getting to know people. I write and act. I love aerobics, sports, and anything else that tests my physical abilities. I have a short-fused temper. I'm the eternal student and want to learn everything I can. Has the biggest imagination ever! Would make a super author. Is a saint. Seriously, the most forgiving person I know. Is an artist and the most creative person I know. Is the most loving person I know. Would go into a burning building to save people without ever realizing the danger to self. Has both feet firmly on the ground. Is very self-reliant and doesn't need to depend on anyone. Give me my makeup bag and lots of perfume. My home... it's decorated just the way I want it. Designer clothes... I like a complete ensemble look. Pastries, candy, desserts... anything sweet. Plants... lots of plants and flowers. Romance... life isn't worth living without it. My tools are a razor, aftershave, and manicure set. My comfy leather chair and a wide screen TV. My credit card, for the best tailor in town. My sports car, of course. Give me pizza, chips and beer. Hiking and being in the great outdoors. Going to parties with my best girl. I have a dream. I can see the future very clearly and know how to make my dreams come true. Talk to me. You can tell me anything and I'll hear every word. Don't fence me in. I might take a trip on the spur of the moment. I'm addicted to nature. I'm looking for my very own Walden's Pond. I don't mind taking risks as long as I know there's a payoff. Don't shout and don't get angry. It makes me feel as though I'm the one	upset or angry. The eyes are the windows of my soul, and mine constantly weep. I guess I don't talk enough, because I get a sore throat when I talk too much. Indigestion. I love spicy foods, but my body can't tolerate them. My lungs. I don't have a lot of wind, regardless what my friends say about hot air. My muscles scream at me when I exercise. My nervous system. I get uptight and anxious too easily. My head feels like it's going to burst open. I get headaches very easily.